I think I’ve officially lost my mind. I’ve been mulling it over for 3 months now since I finished the 100 mile bike ride around Lake Tahoe I thought I could never do, and the other night I had a dream about it, and now I can’t stop thinking about it. I think I might do a marathon next year. Yes, I said it here first: Even though a few years ago I said there was no way in hell I’d consider it…I am considering it. I might make my body go 26.2 miles under the power of my own feet, and try and do it in less than 7.5 hours. I think I might commit the next 12 months of my life preparing for that 7 hours of potential torture. I love running in the rain, so that will be a nice incentive to start this challenge. 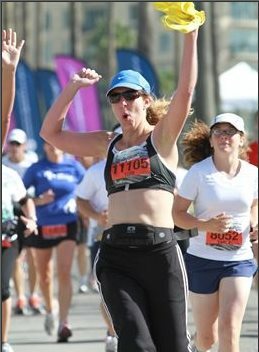 I fell in love with the half at Long Beach International City Bank Marathon and I think I wanna go back and do the 26.2 there next October. 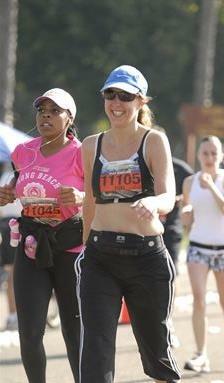 It was my favorite half course out of the 5 that I did in 2010-2011. This plan will of course be pending aggravating my hip injury, but dammit, I don’t think I can get this out of my head now. I think I have to do it. This is also the course where I walked the whole last 6 miles injured and haven’t run seriously since…so I understand this is an ambitious dream my body needs to get on board with. We are going to start with new shoes in October and go from there…but wow, I might say YES to doing this! Whoa.